It’s very important to get some Hong Kong money before you travel to Hong Kong. Most of the city still deals in cash or Octopus Card, so it’s a good idea to come prepared. Hong Kong’s currency is called Hong Kong dollars. You may see it abbreviated as HKD. The value of 1 US dollar in Hong Kong dollars is approximately 1 USD = 7.8 HKD. This number fluctuates daily. Visit XE Currency for the most up to date exchange rates. For more pictures of Hong Kong Money check out our Facebook Page. While you’re there, be sure to “Like” us on Facebook. The best plan of action for exchanging money would be to buy enough Hong Kong money at a bank in your home country to last you for about a day. I’d say anywhere from $500-$1000 HKD is enough. Bring the rest of your money from your home country with you and exchange it in Hong Kong. You’ll get a better rate in Hong Kong than you will exchanging your money in your home country. In my experience the best place to exchange your money for Hong Kong money is at a bank in Hong Kong. They will usually give you the best rate. This is because Hong Kong money is plentiful at Hong Kong banks. Other banks around the world have to get foreign currency sent over to them, thus making it cost more to get some. I’ve also seen some smaller money exchange shops on the streets of Hong Kong that give pretty good exchange rates too. I recommend staying away from currency exchange kiosks in the airport. They will always give you a really bad exchange rate. These kiosks can have bad exchange rates and still get customers because of all the unprepared travellers who land in the airport and need money right away. There’s nowhere else at the airport to exchange money, so you have no other choice but to take the low exchange rate. If you didn’t bring any Hong Kong money with you, I’d recommend only buying what you need right away from a currency exchange kiosk. You can wait until you find somewhere with a better rate before exchanging all of your money. You’ll get a lot more bang for your buck this way. Another good idea is to use a credit card to pay for everything until you can get your hands on some Hong Kong money. Exchange rates for credit cards are usually pretty fair and are better than the rates at the kiosks in the airport. Just remember that credit cards are not accepted everywhere in Hong Kong like they are in some other places in the world. Check for a sticker in the window of a shop to see if your credit card is accepted there. VISA is the most widely accepted credit card in the world, so you’ll have the best chance carrying a VISA with you than any other credit card. Hong Kong money is very interesting because there are 2 completely different sets of coins and bills in circulation right now. 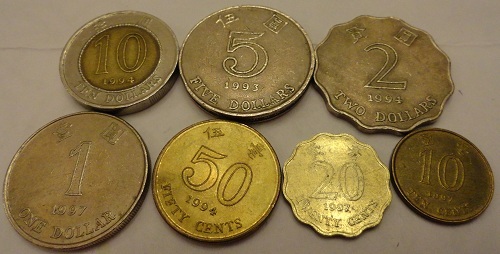 Both are worth the same value, but 1 set is from when Hong Kong was ruled by the British, and the other set is from after Hong Kong’s sovereignty was returned to China in 1997. The British coins have different pictures on the front of the coin than what the newer coins have. The back of the British coins also have a picture of the British Queen or King on it, while the newer coins now have a picture of a bauhinia flower on the back of the coin. The British paper bills also look completely different from the current paper bills Hong Kong has now that they’re under Chinese sovereignty. The British version of Hong Kong money is becoming more difficult to find as the years go by, but it’s still accepted everywhere. If you find some coins with the British Queen or King on the back of it, you may want to keep it for yourself since it’s becoming rarer every day. Hong Kong money comes in all different shapes, sizes and colours. 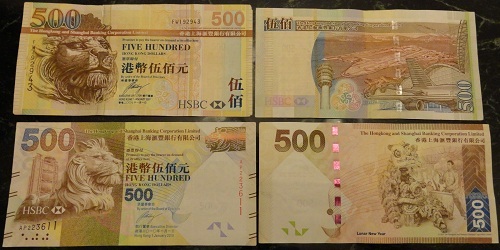 Three different banks issue Hong Kong banknotes. They are HSBC, Bank of China, and the Standard Chartered Bank. It’s interesting that each of the three banks issue banknotes that look completely different from banknotes you would get from the other 2 banks. For example it’s possible to have 3 $100 bills that look completely different from one another. They would all be from a different bank and have the same value. The purple $10 bill is the only plastic banknote in Hong Kong. The rest are made out of paper. 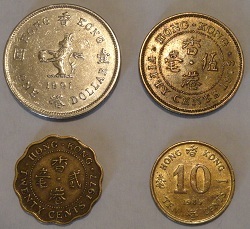 Coins and the purple $10 bill are all issued by the Hong Kong government. The pictures on the front of banknotes from HSBC have a picture of a Lion on the front of it. Banknotes from the Bank of China will have a picture of the famous Bank of China tower in the Victoria Harbour on the front. And banknotes from the Standard Chartered Bank have pictures of animals, such as a fish or a dragon, on the front. The back of the banknotes have pictures of specific areas of Hong Kong on them. Some of these pictures include Victoria Peak, Victoria Harbour, and Tsing Ma Bridge. Usually pictures on the back are different depending on which bank it came from. Some banknotes from different banks do have the same place on the back, but the picture would be slightly different. Like a different angle or period in time. $10 – small, round and thick. Bronze in the middle and silver on the outside. Different currencies from around the world have been an interest of mine for quite some time now. I’ve got quite a good collection going. When I went to Hong Kong I kept at least 1 of every coin and as many different bills as I could. They make for good souvenirs. If you can’t find anything to bring back for a family member or friend, consider bringing back some coins. It might end up being a well received gift from the recipient. Money is usually quite symbolic of the country you get it from. By looking at the pictures on the coins and bills, you can learn things about that country that you never knew. 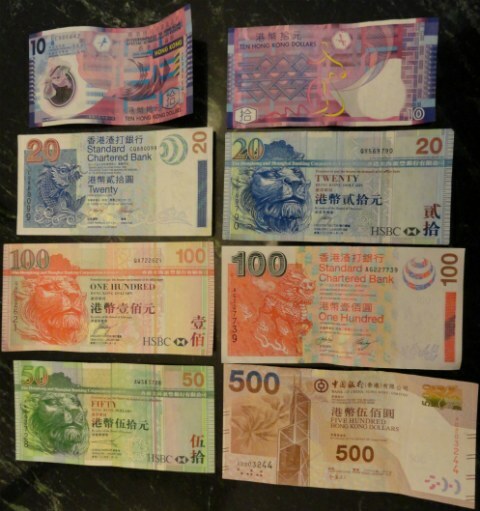 Hong Kong money is definitely a currency with many traits that make it unique and interesting to look at and collect. I always hope to receive a different coin or banknote I’ve never seen before every time I pay for something. It makes paying for items a little bit more exciting.